Chile Lindo Hostel, Santiago, Chile : Rezerwuj teraz! Do not worry about spending money on a breakfast, we include it in the price. We want your stay in Santiago to be the best and enjoy all our services. Your fun and entertainment are also important for the hostel and that is why, very close to it, you will find museums, parks, cultural centers and all the main attractions of Santiago. 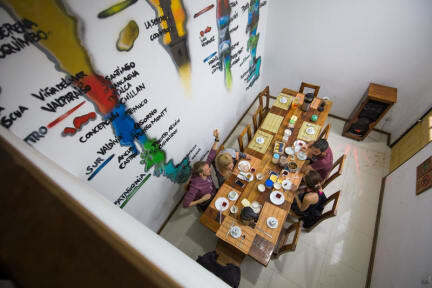 But, what makes it more special to our hostel, is the family atmosphere, you will feel at home! Chile Lindo Hostel is your best option! Payment upon arrival by cash, credit cards. We accept local debit cards too. The hostel will not accept children under the age of four. Chile Lindo Hostel reserves the right to eject guests who violate hostel rules, or who behave in ways which disturb other guests or damage hostel property. After midnight, guests must respect the quiet areas of the hostel. No pets are allowed in the hostel. Smoking is permitted in the patio, but is strictly forbidden indoors, including bathrooms.